Our culinary classroom is the place to learn about and enjoy the fine art of wine and cheese pairing. We also offer Philly Beer School classes, as well, including beer and cheese pairing classes. If you want to delve into the fine art of cheese pairings, you have arrived at the right spot. From introductory courses in cheese pairings to master-level programs, we offer a comprehensive roster of classes. Our students range from beginners to master cheese makers. Get your sommelier on with these cheese pairing classes. We employ a staff of winemakers, brewers, and cheesemakers. We are all about making and doing and teaching. And we offer some serious cheese pairing classes: Our artisanal cheese and wine pairing class is always a blockbuster. A staff favorite is the beer and cheese pairing class because there is nothing closer to nirvana than beer and cheese pairings. We have the top educators in the world of corks & forks, but if you happen to have a class with either Keith Wallace and Alana Zerbe, you’ve got it made in the shade: most of our cheese classes are taught by the Director of Wine Education (Alana) or the school’s founder (Keith). Our cheese pairing classes are some of our most popular classes. We offer both wine pairing and beer pairing classes, and they tend to sell out months ahead of schedule. As a rule at the Wine School, you can’t teach it until you make it. Our instructors are not only brilliant sommeliers and winemakers, but that isn’t enough to teach this class: they have to be cheesemakers, too. Why? Because our classes are not only fun they are super-smart. In this article, we take a look at some classic wine and cheese pairings. For a more comprehensive experience, we suggest taking one of our Wine & Cheese Pairing Classes. The world of wine is overwhelming; every grape, soil type, and climate creates different expressions. The hands of winegrowers and winemakers and their decisions also determine the final wine profile. The result is a myriad of wine styles that take a lifetime to explore. Every bottle of wine is unique. You could say something similar about cheese, deep tradition and a complex process with many variables allows cheese makers to create thousands of different products, all with a particular taste. Wine and cheese invariably find themselves on the same table; somewhere, someone is enjoying a conversation with a glass of wine and a slice of cheese. It’s not a surprise that some cheeses go well with some wines. Mastering the art of wine and cheese pairings takes time and patience, but this guide will surely set a good base for you to enjoy this delightful pair harmoniously. To make these types of cheese, milk is merely curdled and drained. The result is usually a tangy, perishable cheese with a soft, often creamy texture. Ricotta and Queso Fresco are good examples. Goat cheese like the French chèvre and brined cheeses like feta also fit the description. Characteristic moisture and soft texture are always present. The flavor can be persistent but will never be overwhelming. The best pairings for these types of cheese are light-bodied white wines, those with fruit forward profiles and tight acidities. Wines meant to be drunk fresh that have no aging and spend most of their time in stainless steel tanks. Think Sauvignon Blanc, unoaked Chardonnay, Pinot Grigio, and Vermentino. We are pairing wine and cheese by weight and using the acidity of the wine to balance the sharpness in cheese. Some herb flavored soft cheeses exist, and its herbaceousness can match vegetal whites like Sauvignon or Grüner Veltliner. You can pair stretched cheese, like mozzarella or Oaxaca in the same way; also burrata and other whey cheeses. Some of the most delightful cheese around the world has a soft, creamy texture. French Camembert and Brie are great ambassadors of the style. Époisses, Reblochon and the heart-shaped Neufchâtel, also have a similar profile. Don’t be fooled by the bland texture; these cheeses can be pungent and fairly intense. The French Munster cheese is one of the most intensely flavored cheeses in the world but can be as soft as butter. To pair these cheeses, we must find bold wines that won’t fall short. Full-bodied Chardonnays, traditional white Riojas or oak aged Viognier will have the necessary weight for the task. The dairy creaminess common in some white wines, a product of malolactic fermentation, mirrors the flavors in cheese perfectly. A light-bodied red wine like a Pinot Noir or a Beaujolais can be a good option, as long as it has the necessary acidity to hold ground against the unctuous cheese. Intensely aromatic cheese might work well with equally intense white wines like Gewurztraminer or Riesling. As cheese ages, it loses moisture and gains flavor concentration. Cheddar, Edam, Emmental, and Gouda are considered semi-hard cheeses. Their creaminess is characteristic, and so is their firm, but malleable texture. Moreover, the flavor can be mild or quite assertive. 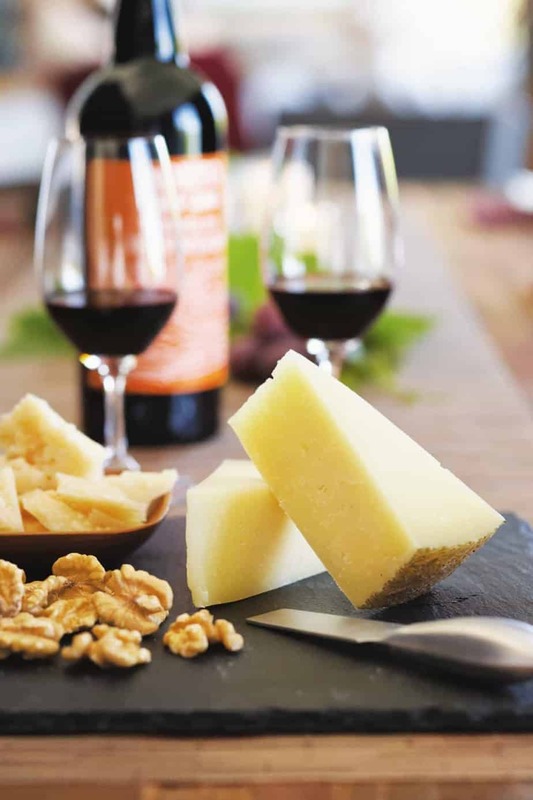 Semi-hard cheeses will pair nicely with medium-bodied red wines like Merlot, Malbec or a Montepulciano. We have to treat hard cheese differently. Both Parmigiano Reggiano or Manchego have a solid texture. These cheeses are usually bold and straightforward; they can be aged for several years before coming into the market. Match their intensity and mouthfeel with assertive, structured red wines like an aged Tempranillo or a Cabernet Sauvignon. When you inoculate cheese with bacteria, from the Penicillin family, a miracle happens. Blue spots and veins develop in the cheese creating incredibly fragrant aromas and ferocious flavors. Cheeses like Stilton, Roquefort, Cabrales, and Gorgonzola dominate the segment. Their character is hard to match, and their sometimes-overwhelming salinity poses a challenge for Sommeliers. Traditionally, only sweet, bold, and often fortified wines like Vin Santo, Port or Muscat de Beaumes de Venise dare to match these delicacies. Sweetness balances the saltiness and the coating unctuousness of the sharp cheese. Other sweet wines like Sauternes or Tokaji are good contenders too. Some people prefer pairing blue cheese with bold red wines like Côte du Rhone or a bold Cabernet, but you must try for yourself to find out what works for your palate. When in doubt, find a local pairing. Regions with old traditions in cheese and winemaking have congruent palates. The French make their goat cheese in the same area as their tangy Sauvignon Blanc. Manchego pairs best with sturdy Spanish Tempranillo and Époisses comes from the same region home to the classic Burgundy Chardonnays. Be bold, creative and propositive. Messing up a cheese and wine pairing is hard, they’re just meant to be enjoyed together. The result will almost always be greater than the sum of its parts.